1-3 Months - Quiet time alone is very important to babys development. Let your baby enjoy the gentle rocking movement of the 3-in-1 Rocker Napper while playing with the rattling snail and flowery mirror. 3-6 Months - Move the Rocker Nappers hanging electronic toy to the appropriate distance from babys palm, so that when he raises his hand he can hit the toy or, later, grasp it with ease. 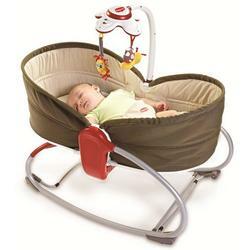 0-6 Months - If your baby suffers from reflux, the middle reclining position is ideal and may help her digest more easily.